after the battle with galaxia was over and the starlight's returned home life on earth returned to how it once was. the girls went back to school mamoru was back but he was now going to med school though usagi refused to let him leave the country again. and everything was peaceful. 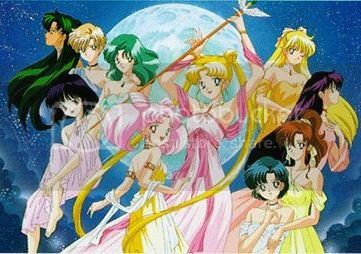 the inner senshi finished school some going off to follow their dreams others going on to something higher. mamoru had proposed to usagi who said yes immediately. usagi happily called the girls to tell them and threw herself into planing the big day. with promises from the inners as well as the outers of attendance from them usagi couldn't be happier. the outer senshi have taken to monitoring the outer solar system from the base below the crown arcade. michiru and haruka finished school and hotaru's living as a normal teenage girl. setsuna is free to come and go at the time gates as she pleases. haruka has gotten just a bit more famous in her racing career and travels quit a bit more often for races than she had in high school. michiru continued on with her music career as well as her painting though haruka performing is far more rare as the blond is gone most of the racing season at this point. everything was great for the senshi until a week before the wedding. everyone was back in tokyo when the attack happened. senshi in black as well as monsters attacked the city. the senshi fought to protect their planet though the girls failed some going into hiding to plot and plan on how to take back their home others captured and thrown into a prison that is unknown to all but the kuiper senshi. hospitals are constantly over filling as it's not possible for the senshi to do much fighting anymore. usagi has called to kinmoku for help and the starlight's were quick to respond coming to earth and posing as a boy band once more. the kuiper senshi have become suspicious on why the three lights suddenly got back together. meanwhile in crystal tokyo chibi-usa and the quartet have notice strange things happening. they are not quit sure exactly what to think on it and have gone to the past to find out whats happening. upon their touch down in juban park they get attacked by a monster. upon transformation they are confronted by the kuiper senshi. chibi-usa wants to know whats wrong but the quartets only thoughts are protecting the young princess. with the kuiper senshi rampaging around the city and some of the sol senshi captured is it a bright future we have coming? or is it a dark future they see ahead?